A recipe for Yellow Lentil Soup with Vegetables. 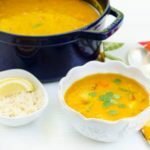 Yellow lentils (Toor Dal) are cooked until soft, pureéd, and vegetables are added to make a delicious soup. The soup is served with rice and lemon wedges. Clean and pick through lentils for any small stones and grit. Rinse several times in cold water until water is fairly clear. Drain and transfer lentils to a large saucepan. Add 3 cups water and soak for 10 minutes. Bring to a boil, uncovered, over medium heat, skimming froth off surface. Cook, partially covered, until dal is soft and mushy, about 30 minutes. Purée in blender or using immersion blender, or whisk vigorously to batter-like consistency. Return to pan. Stir in another 3 cups water and turmeric. Add tomato, potato, carrot, green beans, cayenne pepper and salt. Cover and return to a boil over medium-high heat. Reduce heat to medium-low and simmer for 12 to 15 minutes. Meanwhile, in a small saucepan, heat oil over medium-high heat. Add cumin seeds. Sauté until cumin is fragrant and a shade darker, about 30 seconds. Add garlic and sauté for 1 minute. Add onion and cook until golden, about 10 minutes. Pour mixture into dal and simmer, covered, until vegetables are tender, about 5 minutes. Place 2 to 3 tablespoons rice in each bowl. Top with dal and vegetable mixture. Garnish with cilantro. Serve with lemon wedges on the side. Recipe ©copyright 2004, 2013 Suneeta Vaswani from the Easy Indian Cooking Second Edition cookbook. Used with permission by Robert Rose Inc.